SHELBY TOWNSHIP, Mich. & CHICAGO--(BUSINESS WIRE)--Visit KUKA Robotics in booth N6200 during the International Manufacturing Technology Show to see the future of manufacturing live on display! KUKA has curated automated live booth demonstrations to showcase the hot topics of today’s manufacturing revolution. Industry 4.0 or Internet of Things “IoT” is no longer concept but a reality. Stop by the booth to see the latest in additive manufacturing, 3D Metal printing, 3D measurement inspection, collaborative robots, safe operations, vision-guided robotics, cloud-based automation monitoring, and CNC-based controls and KUKA KORE for next generation in STEM education. Official KUKA Robotics System Partner Midwest Engineered Systems has partnered with several international industry leaders to develop a complete and scalable additive metal manufacturing solution. Additive manufacturing commonly referred to as Industrial “3D Metal Printing” is a digital process, which uses 3D design data to build components in layers by depositing material. This demonstration by an Official KUKA Robotics System Partner will showcase the strategy for manufacturing of a workpiece, preparation of the slicing program, translation into the robot path program, process development for the laser welding, laser delivery system, hot wire feed of material, and dynamic deposition measuring to compensate for adverse conditions. Unique on-board processing enables unlimited multi-imager array configurations by expanding the scan area to deliver automated rapid inspection of all features and surfaces, dramatically improving cycle time. The actionable data is displayed as a simple go/no-go result or an easy-to-read dimensional deviation color map. This new technology from FARO showcases easy integration into production environments, automated deployment options when attaching Cobalt Imagers to a robot, and overall improvement with throughput and productivity of 3D measurement workflows. The FARO Cobalt Array Imager brings unparalleled performance at an affordable price for quality inspection and factory automation applications. KUKA will feature multiple collaborative robots showing a range of applications demonstrating how collaborative robots can be used in Human Robot Collaborative applications industry. KUKA will also feature how it is possible to use traditional industrial robots in collaborative applications by incorporating auxiliary safety technology. 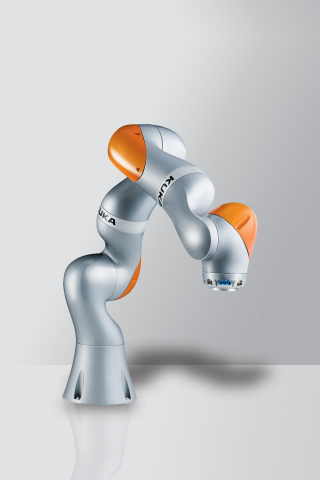 KUKA Robotics introduces the EMCO Concept TURN 260 as part of KUKA Robotics’ education area. The Concept TURN 260 brings CNC training with industrial performance. This high performance semi-industrial CNC lathe is part of EMCO Industrial Training where students are able to program advanced to complex CNC programs using a 3-axis lathe with a life-tooling turret at industrial standards and a 3-5 axis milling machine with industrial performance rates and complexity. Demonstration featuring a KR 6 R700 showcasing Siemens Run MyRobot Machining provides a standardized solution for the machining robot based on the combination of CNC and robotics know-how. By utilizing the KUKA robot, Siemens Run MyRobot offers a cost-effective and greater productivity solution for large machining areas. High accuracy by machining is also achieved with the KR 6 R700 because the precision is supplemented by the support of the robot-specific know-how making the robot a CNC robot with the Siemens Run MyRobot. KUKA Connect is an all-new software platform that connects KUKA robots to the cloud. Using KUKA Connect, customers can easily access and analyze their robots’ data on any device, anywhere at any time. Built on open global standards, KUKA Connect securely leverages cloud computing technologies and big data analytics to provide customers maximum visibility into their connected KUKA robots. KUKA Connect is a subscription-based platform that requires zero software installation and provides customers immediate access to new features and functionalities. Leveraging the latest web and mobile technologies, KUKA Connect features a responsive user interface that allows administrative users to construct seamless workflows with easy accessibility to multiple layers of robot data. KUKA Robotics introduces the new KORE Official Robotic Education Cart designed to support the education market’s need to make robotics a KORE part of their STEM (science, technology, engineering and math) education programs. With the KUKA KORE package students are given the opportunity to learn and perform basic robot programming and operation skills on robotic hardware. Students will also have the opportunity to mine for clues in the KUKA booth and take the KUKA Kraze mobile quiz to enter for a chance to win a STEM party for their class visiting IMTS! KUKA KORE can also be found in the Smartforce Student Summit in booth NC-631 with a maze challenge for students understand the basic behind-the-scenes programming and the opportunity to win KUKA-branded giveaways. KR CYBERTECH nano series boast the world’s largest model range in its class offering 6 kg to 22 kg payloads in the future. With the KR CYBERTECH nano series, payload intervals of 6, 8, and 10 kg is perfectly equipped for arc welding. The new hollow wrist features a level of performance and quality that enables the robot to move up close to workpieces with infinite rotation and motion precision. The KR 3 AGILUS is built for the production of the smallest components and products. This new small robot is ideal for use in 600 x 600mm automation cells since it excels at reaching maximum automation performance in confined spaces. The KR 3 AGILUS is one of the fastest robots in its class offering minimum cycle times and larger production outputs. This robot is ideal for applications such as assembly of small parts, pick and place, dispensing, screw fastening, brazing, etc. This cell demonstrates the speed and agility this small robot was designed for by minimizing the cycle time while tending a CNC machine tool incorporating vision inspection and post machining part deburr. End of arm tooling is a dual gripper for quickest possible part change. KUKA Robotics Corporation along with KUKA Roboter GmbH, Augsburg Germany (part of the KUKA Aktiengesellschaft group of worldwide companies), ranks among the world's leading suppliers of industrial robots and material handling vehicles. Core competencies include the development, production, and sale of industrial robots, controllers, software, linear units, and omniMove™ omni-directional motion platforms. KUKA robots are utilized in a diverse range of industries including the appliance, automotive, aerospace, consumer goods, logistics, food, pharmaceutical, medical, foundry and plastics industries as well as multiple applications including material handling, machine loading, assembly, packaging, palletizing, welding, bending, joining, and surface finishing. KUKA robots range from 5kg to 1300kg payloads, and 635mm to 3900mm reach, all ontrolled from a common PC based controller platform.